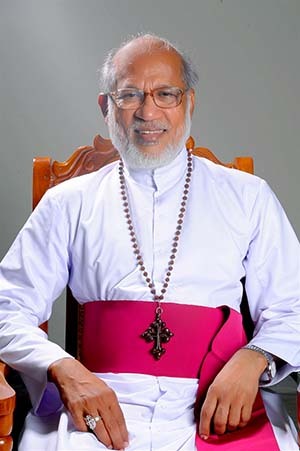 Mar George Cardinal Alencherry (Mar Geevarghese Bava), is the current Major archbishop of Syro-Malabar Catholic Church and the Archbishop of Ernakulam-Angamali. He was created a Cardinal of the Catholic Church and the titular Archpriest of San Bernardo alle Terme in Rome on 18 February 2012 in Rome. Elected by the Syro-Malabar Catholic Church Holy Synod, and ratified by Pope Benedict XVI, Mar George Allencherry is the current Major Archbishop of Syro-Malabar Church succeeding Mar Varkey Vithayathil. Mar George Cardinal Alencherry (Mar Geevarghese Bava) was born on 19 April 1945 in the parish of Thuruthy in the from archdiocese of Changancherry as the sixth child of the ten children of Mr. Philipose and Mary Alencherry of whom two others are priests (Fr. Jose Alencherry and Fr. Francis Alencherry, SDB) and one, a religious sister Sr.Cherupushpam, S.A.B.S.). Geevarghese is his baptismal name. Mar Alencherry had his primary schooling at St Mary's School, Thuruthy and secondary education at St Berchman’s High School, Changanacherry. He began his priestly formation in 1961 at the archdiocesan minor seminary at Parel, Changanacherry. While he pursued his studies in the minor seminary, he obtained his BA in economics with second rank from St Berchman's College. After the minor seminary studies he was sent to St Joseph’s Pontifical Seminary, Aluva where he completed his philosophical and theological studies. On 18 December 1972 Cardinal Mar Antony Padiyara, the then archbishop of Chanagancherry, ordained him priest at Marthu Mariyam Church, Thuruthy, for the archdiocese of Changanacherry. Later he continued his higher studies at the Pontifical Institute of Theology and Philosophy from where he obtained his master’s degree in first rank. While Mar Alencherry was pursuing higher studies at Aluva he served also as vicar of the filial church at Periyarmugham in the archdiocese of Ernakulam‐Angamaly. After completion of studies at Aluva, Alencherry was appointed as assistant vicar at the Cathedral church of Changanacherry and Director of the Archdiocesan Faith Formation department. Thereafter he served three years as secretary of the Commission for Catechism of the Kerala Catholic Bishops’ Council (KCBC). After his tenure in KCBC he was sent to Paris for higher studies. There he pursued his studies at Sorbonne University and the Catholic Institute from where he obtained his doctorate in biblical theology. On returning to India in 1986, Alencherry was appointed director of the pastoral Oriental Centre (POC) at Palarivattom and deputy secretary of KCBC. He served the Church in Kerala in that capacity until 1993. Simultaneously he had served also as professor at St Thomas Apostolic Seminary, Vadavathoor. He continued to teach at Vadavathoor until 1997. From 1994 to 1996 he was the protosyncellus of the metropolitan of Changanacherry.